Whether you're playing in the Super Bowl, having fun with friends or jogging down A1A in Jacksonville Beach, Achilles tendonitis can easily flare up. The Achilles tendon is the thick cord on the back of your lower leg. It connects the powerful calf muscles to the heel. When it happens, you will notice pain an inch or two above your heel. This is the watershed zone of the tendon, the spot where all the blood vessels come in to supply nutrients. Unfortunately, this is also going to be ground zero for the body's inflammatory response. This is a fancy way of saying your body detects the small problem, overreacts, and the small problem becomes bigger and bigger. 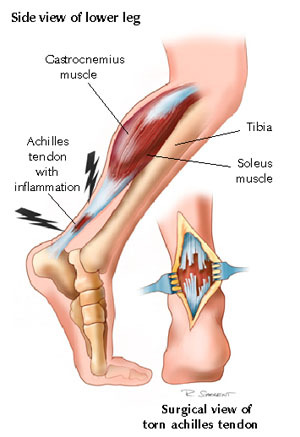 The Achilles tendon was named after the invincible Greek warrior Achilles. The only weak point for this Trojan War hero was his heel. And what a weak point it is! Injuries to the Achilles tendon are among the most serious in the lower extremity to be treated by Dr. Vimal Reddy at the First Coast Foot and Ankle Clinic. Long-term treatments consist of correcting the root cause of Achilles Tendonitis; either your muscles and tendons are stiff because you are doing too much too soon, or you are overpronating (flattening out your feet). In the case of stiffness, you can correct the problem by adding a regimen of stretching before and after exercise. Overpronation can be corrected with custom orthotic shoe inserts. In the short run, you should rest your sore Achilles. Aspirin may be appropriate to use depending on your situation. For more information, consult with Dr. Reddy to determine the best treatment for your painful Achilles.